Lunch today is at Hanson Bay Cafe. 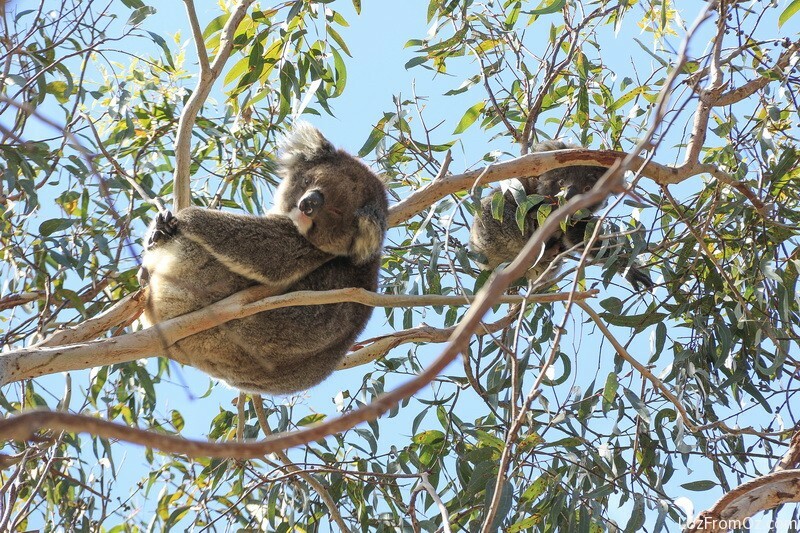 Situated in a wildlife sanctuary renown for its population of Koalas, it is a rustic setting that totally fits in with its surroundings. 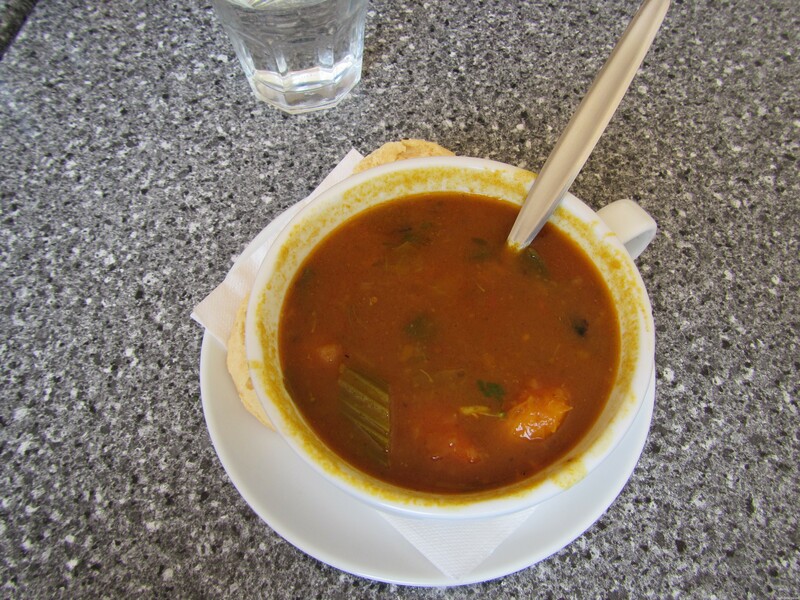 Before we head out to spot our furry friends, lunch of hearty vegetable soup, salad and crusty bread goes down well. 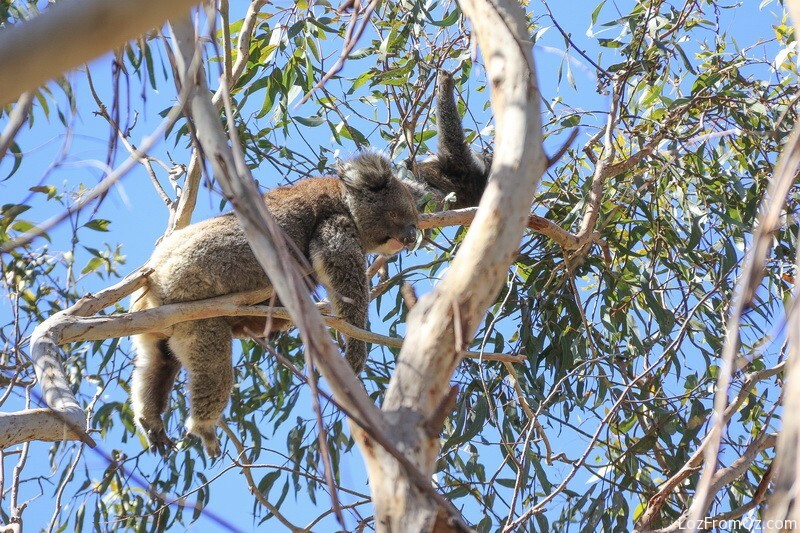 With full tummies after emptying our plates, it is time to gather camera gear and move out on our Koala Safari. Let me tell you, spotting bundles of fur up a tree is not as easy as it sounds. 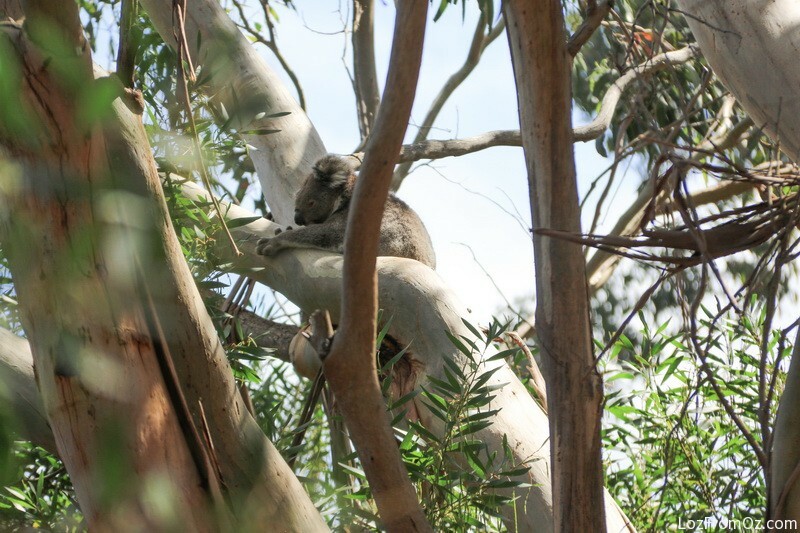 Is that a koala or just a clump of leaves? Walking, walking down the tracks we are all on the lookout and it’s a wonder we don’t trip over while we are busy with our eyes looking skyward. 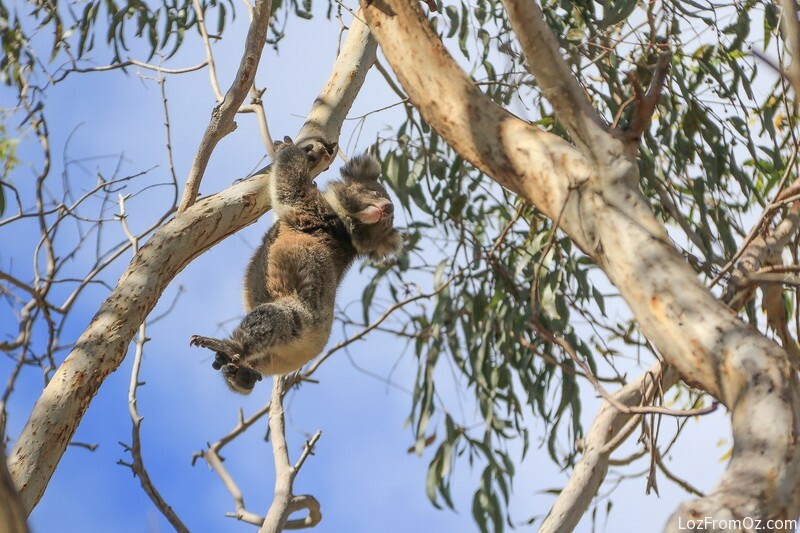 When a koala is spotted, those in the area move quietly towards it and with cameras all pointing upward the clicking commences. These little buggers are hard to photograph as you have to allow for all the branches and leaves and then you have a blue, sunny sky behind them. Still the photos don’t turn out too bad. There are not as many as I hoped and most of them are high up, but every now and again a little flash of blue on the ground catches my eye. 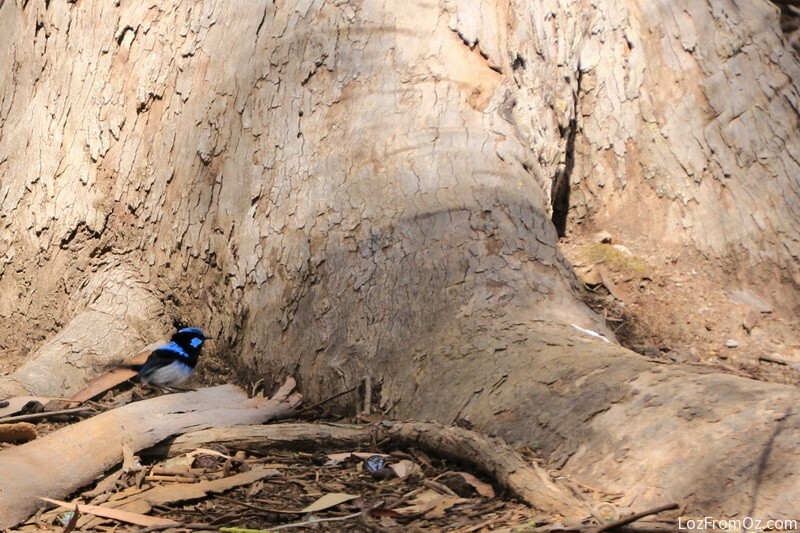 It is a little blue wren – how pretty – just hopping around. Giving my poor old neck a rest from looking up, once the camera is pointed to the ground I decide to have a look around down here and find a rather nasty looking bunch of grubs. I don’t know what sort they are but there sure was a lot of them. They remind me of a song by Burl Ives – The Ugly Bug Ball. I will say now that this will be well before your time – it’s in a Walt Disney movie called Summer Magic – yep, pretty corny I know but lots of fun! 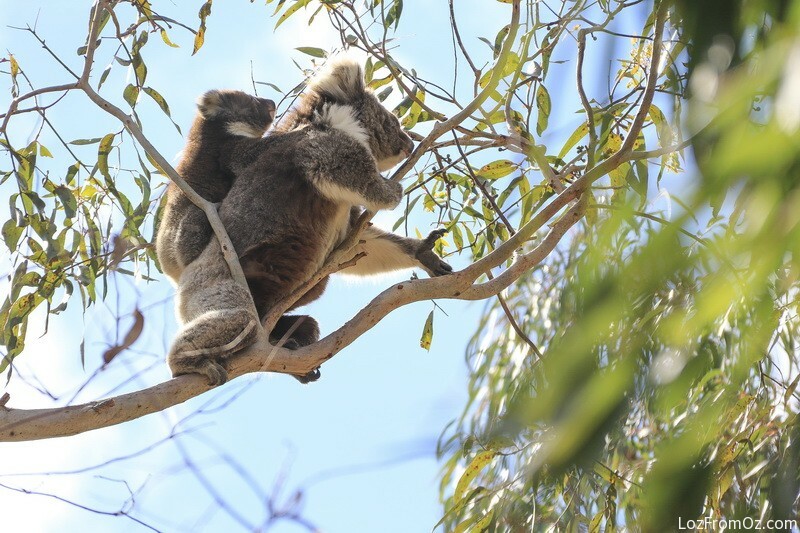 Back on the hunt and we are lucky to find a mother and joey. They are high in the tree but some good photos were taken with my big zoom. The little one is busy exploring new worlds but mum is still keeping an eye on him if he starts to wander too far, come to think of it she is keeping an eye on us as well. 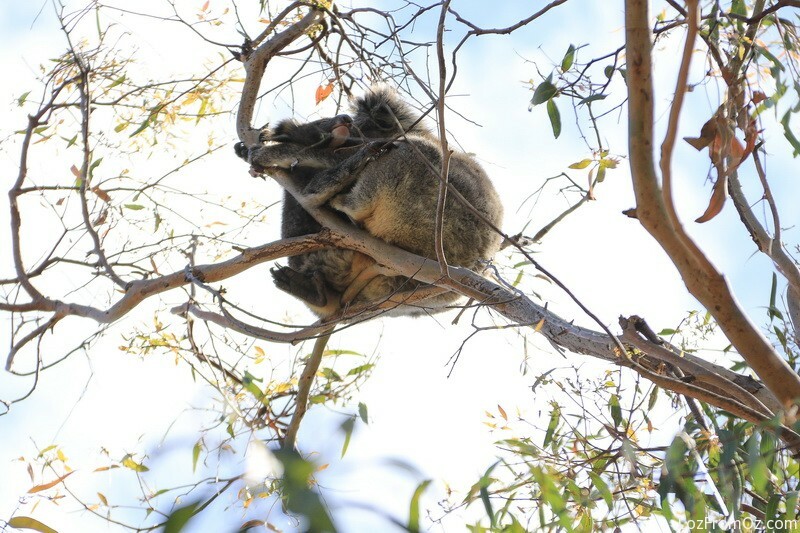 By the looks of her in the tree the baby is running her ragged, like all babies do to their mums, but she has only a minute to have a relax and then he is back on the move again. A mother’s duty is never done! She has decided that enough is enough and it is time to take her baby away from the noisy clickers, but of course, we stay clicking away until they disappear into the foliage and anyway it is time for us to move to our next points of interest – lighthouses and arches. Back into the bus and as we tool off down the road, the brakes are thrown on and we are told that Jonathan has spotted an echidna. How on earth he managed to do that AND drive the bus is beyond me, but I guess it is a requirement of all CB Tour Guides to multi skill. We are told we will have to be quick to get photos before Eddie the Echidna heads off into the bush. Unfortunately Eddie is too fast for us and heads for cover – but the friend of all wildlife and photographers (who will become known as Mr Mirrorless) starts chasing him and trying to direct him back to us with a long stick. That sure works as Eddie takes off at a trot to disappear in the undergrowth and we miss our photos. 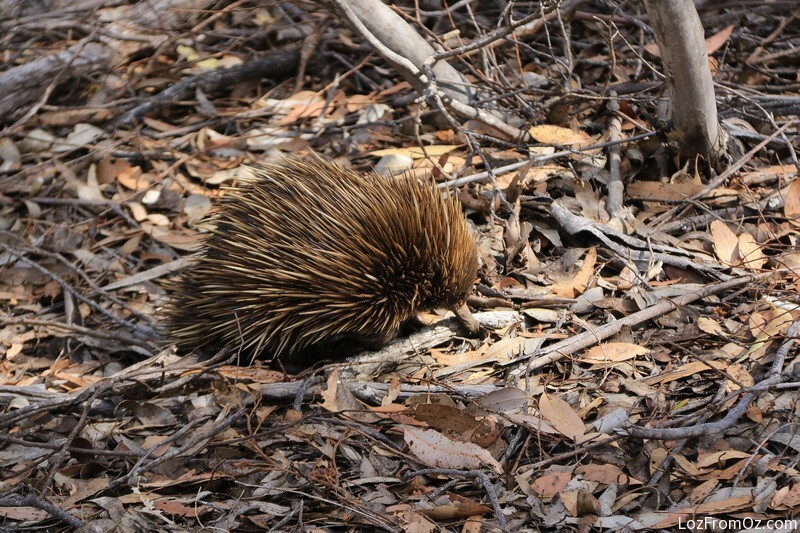 Down the road again and we spot another echidna. Out of the bus at a great rate of knots and grabbing the cameras we see our little spiny friend searching for a quick meal of tasty ants. He is taking his time turning over the bark and leaves and of course our friendly Mr Mirrorless must get in the front and takes over again. Standing practically on top of Eddie the Second, it’s a wonder that any of us could get photos. Some excuse about having a mirrorless camera and no zoom so I have to get close is offered but I just look and roll my eyes and stay clear in case my foot makes an unplanned attack. I wait until Mr Mirrorless is out of the way (he having been told to move so that others can get photos) and the photos we get are quite good. I really do try not to make disparaging remarks on my posts about fellow travellers or tourists but being on a photography tour with photographers, one expects people to be aware of others who are trying to take photos. Still, no matter where one travels there is always one who is oblivious to everything and everyone. OK – that’s enough. I am sure that sometimes, not often, just sometimes mind you, I am the offending ratbag. Yes, it is incredible to believe. 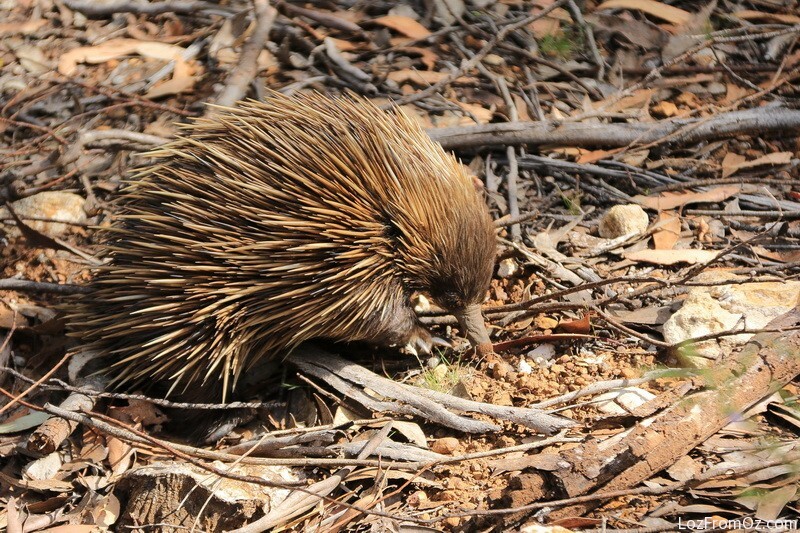 What fabulous little creatures are echidnas! They are monotremes – there’s a word you can google if you don’t know what it means. 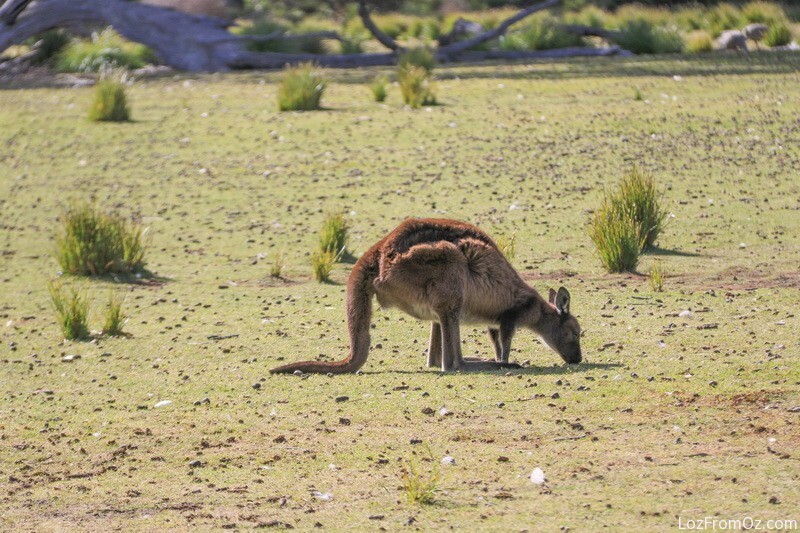 After about 10 minutes it’s back on the bus and we are heading to a lovely open landscape where kangaroos and geese abound – or so they tell us. We walk down towards the area which is surrounded by shady trees and none of the inhabitants seem to be worried about us. 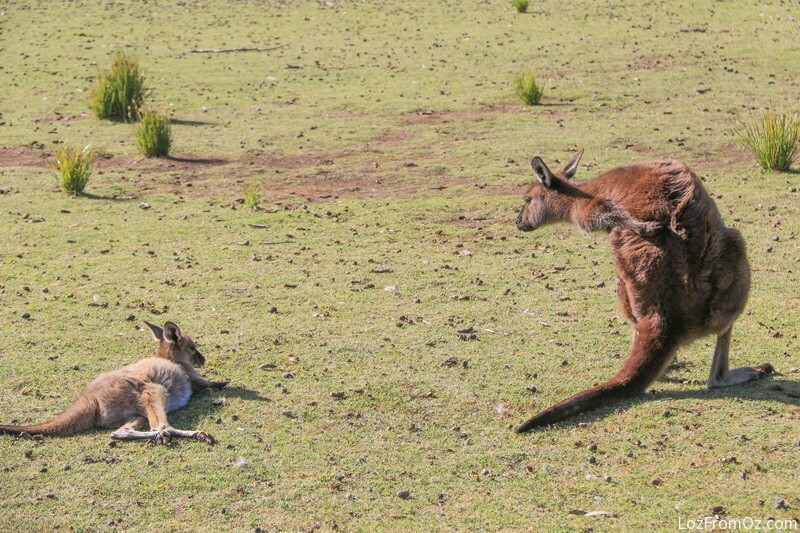 The kangaroos just look up and then go back to eating and scratching and resting. 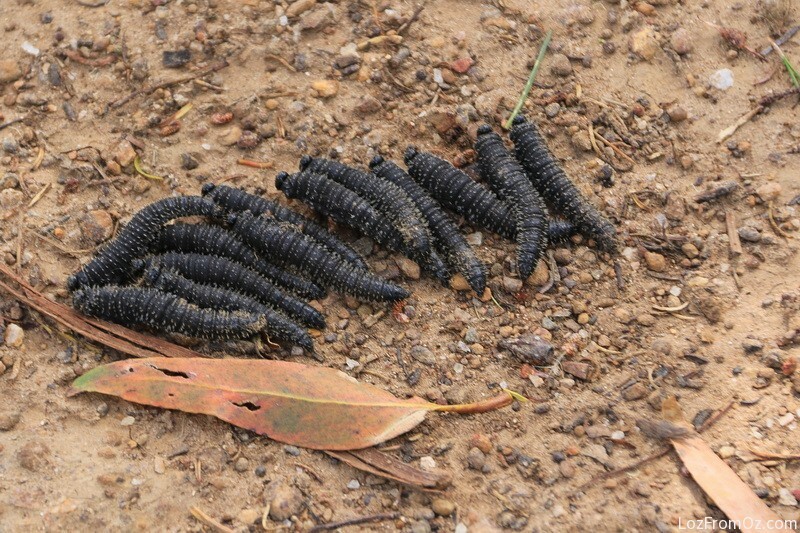 We try in vain to dodge the kangaroo droppings that are everywhere, one good thing there is no odour and they are firm little pellets, but that is too much information I guess. I amble from one side of the park to the other and then back again. 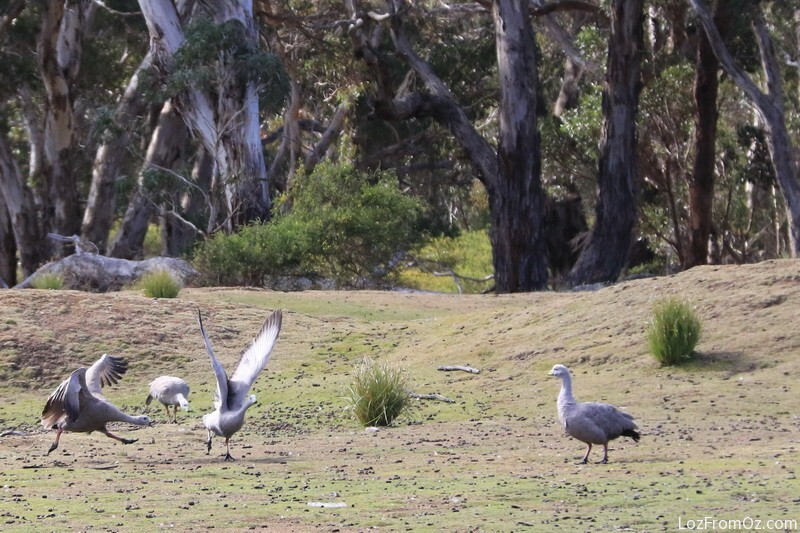 The Cape Baron Geese are not paying any attention to us – they seem to be engrossed in their own little family activity squabbles. 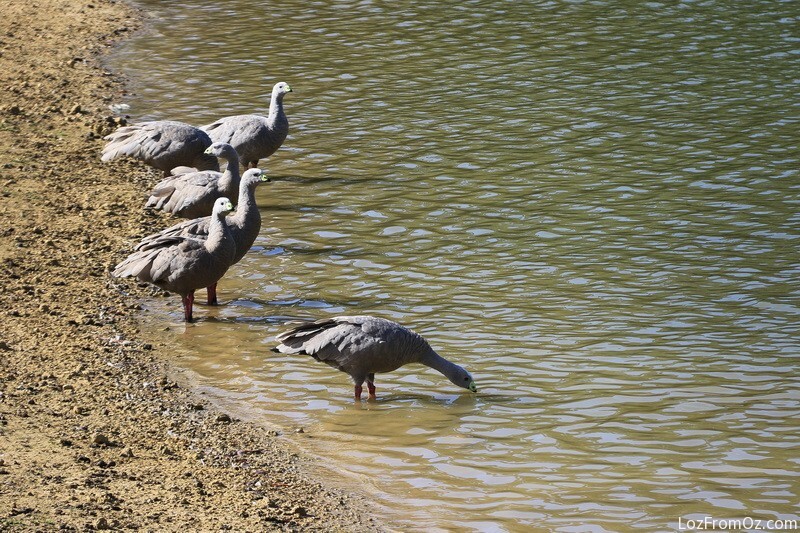 After things settle down they head to the dam for a paddle and a drink. What a great area just to sit and watch but unfortunately there is nowhere to sit that is not covered in roo poo or goose goo! Maybe a letter to the KI Council asking for suitable covered seating is in order? We stay here for about an hour or so an, and then, yep back on the bus for the finale of our day – lighthouses, arches and rocks.